Location of IR sensor on VIP5662W? Just got a VIP5662W, and want to control via my IR repeater. Never had trouble finding a sensor before, but cannot see this one. What IR repeater are you using? There is ample discussions on the new receivers, working on a few select IR sender/receivers. Might it be because the current remote is a Bluetooth device? No, it works with a universal remote. Just not with the extender. It is an AGPtek, which is a cheap, generic, though it has always worked well. One odd thing, it gives a feeble little blink when operating the TV box instead of the nice solid flash you get with everything else. Also, as I say, I don't really know where to attach the flasher. Not sure which AGPtek model you have, but the 5662w uses 36 kHz or 38 kHz IR frequency. I have opted for the downgrade. Just to finish up the storey, an ISB7050 arrived in due course. It helpfully has the location of the IR sensor marked in the manual. It did not work with a Sumnacon repeater, nor did it work with an AGPtek repeater. I ordered a BAFX Products repeater, and it works! The specs for all these things are the same (they are all at the cheap end of the price spectrum) so it is a mystery. Good luck. My idea of an IR extender is that it gets IR codes at its sensor and repeats them at its, er, flasher. Why wouldn't it work with any IR device? Does an IR extender have some smarts that interfere? Are there different wavelengths involved? Clearly there's more going on with IR extenders than my simple idea. Any enlightenment welcome. Thanks. Also I should mention that you did put a link to a model on amazon called nextronics. 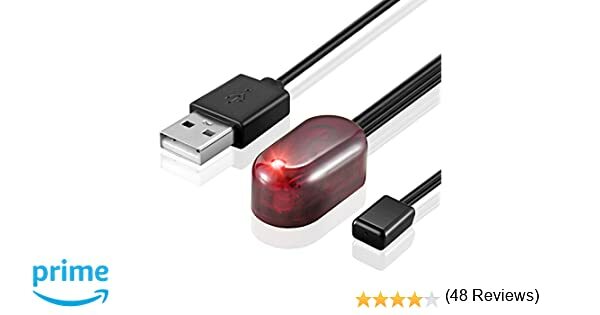 What about a simple emitter with a 3.5mm jack? For my setup the PVR box is behind a kitchen cabinet and my TV has an IR output that should work to control the box yet doesn't. I suspect that the issue is that not all IR emitters seem to work with the telus boxes as seen in the previous discussions. And it's ridiculous that there is no jack in the box itself to connect to a IR receiver. Really a dumb problem. Telus should have a ready solution for this for installations that the install should be able to inform about. Ie: here is a list of products that are capable to use, even if this means I have to go buy and install it myself at least I know they will work. My install guy said any IR extender would work but that doesn't seem to be the case. I have a working setup with my Arris behind my TV (completely hidden) - here's the deal. 2. The Harmony is a bluetooth remote so I thought that it would work via bluetooth...but no luck. Telus does not allow a different bluetooth remote to connect to the Arris even though there is a pair button on the back. 4. Plugged the repeater in and everything worked first try...no issues.